I've read some 150 books within last two years. I bought two of them: Snuff by Terry Pratchett, because I worship anything written by Terry Pratchett and Smile or Die by Barbara Ehrenreich, because I'll support anyone who stands up against the Enforced Smiling Culture. Unless you're a very lucky individual, you'll recognise what culture I'm talking about. It's the culture of 'think positive', 'quit moaning' and 'fake it till you make it'. If I was to describe this culture in one word only, I would choose 'nauseating'. While the book was good enough to allow me to recommend it with clear conscience, it was the concept behind Smile or Die that left me breathless with excitement. Wow, finally someone has said it out loud! Finally someone has noticed and cared enough to write a book about the terrorists from the Smiling Society! But what exactly is wrong with smiling? Read on to find out. What's wrong with a smile? There is completely nothing wrong with smiling, as long as it's an expression of real happiness, joy, playfulness, humour. There is EVERYTHING wrong with forcing people to smile when they don't feel like smiling. Does our society reflect this simple truth? If you feel tempted to say 'yes', think again. Positive thinking has invaded both work spaces and private life. If you don't show enthusiasm, surely there's something wrong with you? If you don't show a brave face when confronted with a misfortune, aren't you weak, moany, unattractive loser? Complaining will make people unhappy around you, they will not want to be your friends, your customers, your associates. 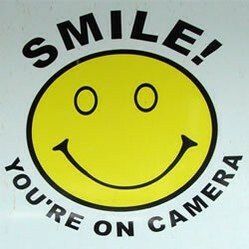 So get your act together and SMILE! Can you recognise any of this? Can I risk a guess that you can? I'm sorry guys, but the world does not consist of pink bubbles and glorious sunshine. Sure, it includes those things. It is full of amazing, breathtaking beauty, full of kind people and inspiring ideas. It is also full of ugliness, cruelty and - to put it quite bluntly - bastards. Pretending we don't see the dark side of reality does not make it go away. If anything, it only makes it bolder. Problems have to be recognised before they are solved, yes? Sadness, anger, dissatisfaction, they all have their uses. They can be a warning sign, a clear message: get out! I believe it is not too smart to ignore such messages (unless, of course, someone is aiming at a life full of unhappiness hidden behind a smiling facade). They can be natural, healthy reaction to an unpleasant impulse. There is nothing healthy with forcing a smile on your face when you are suffering. Ehrenreich wrote a lot about smiling at work. She postulates that all the attitude boosting techniques are only a tool for keeping workers in line and I couldn't agree more. If you find yourself in an unpleasant situation, there are basically two reactions open to you: you can rebel or get over it. Rebellion at work is extremely inconvenient for the employer. Angry, sulking workers undermine productivity and damage company image. No employer wants that. In the long run, it is cheaper to hire a 'positive thinking coach' who brainwashes workforce into thinking that it's ok not to get a pay rise than to actually sign fatter paychecks every month. Teaching employees to be happy with whatever they have makes more economical sense than improving their work conditions. Do you still feel like smiling? Here's another of Ehrenreich examples for smile terrorism that is as cruel as it is ridiculous - treatment of cancer patients. Why on Earth should cancer patients smile and be happy? What can they be happy about? Their illness can mean a death sentence and definitely means long, unpleasant treatment and mental anguish. How could anyone expect them to smile? Pink ribbons, pink teddy bears and all other fluffy rubbish that is being sold by the ton (and often bought by charity organisations who are supposed to fund cancer research) and given to cancer patients serve two purposes: filling coffers of the manufacturers and making it easy on the people who do not have cancer. We are not comfortable with suffering and pain. It freaks the hell out of us, mainly because it reminds us about our own frailty and mortality. This is a very human, very beautiful emotion. Why hide it behind a stupid teddy bear? It's not as if it can make death go away. Ehrenreich quotes many patients (including herself) who are actually infuriated by all this cheering up going on. Nobody likes whiners. Don't rant in public. If you don't like something, ignore it. Don't criticise. Don't complain. Look for the positive side. Luckily, the above advice is not necessarily good. Let me offer an alternative view. I LOVE an intelligent rant. I love a good, heated discussion (not achievable when everyone agrees with you!). I am bored to tears by crowds of compliers and conformists. I don't respect people who blindly follow trends and never criticise a thing. I run away from individuals who smile all the time. Sometimes I feel that we are being trained to forego any backbone and this thought makes me very angry. There is nothing wrong in not liking something - or someone, as the case may be. There is nothing wrong with voicing it. Yep, it might turn customers away. It might hurt someone's feelings. It will, though, conserve your integrity and ability to express an honest opinion. Who else makes fun of positive thinkers? Barbara Ehrenreich is not the only author who claims that 'positive thinking' is a sham. I'll be adding to this paragraph as soon as I chance upon new titles. Did this article make you smile? No? Good. It was not supposed to. I'm talking serious stuff here. I cannot prove it in any way, but I deeply believe that all the mass shootings that happen these days are caused by suppressed anger, grief, frustration. How about skyrocketing depression rates? How about all the people who feel inferior, believing there's something wrong with them because they don't feel like smiling all the time? We've turned positive thinking into a torture. Perhaps we should re-think this choice. That's what I believe, too. I'm glad you're throwing your professionl weight to confirm this. As a therapist I can say that smiling does not help solve problems. There is a place to smile even if you do not feel like it, but for solving problems you need to accept the pain, feel it and work through it. Then smiling comes naturally far more often. Right. I, too, believe we should address our suffering, in whatever form it comes, and not sweep it under the carpet. Thank you for your article!